Phnom Penh, Cambodia, Feb 5, 2019 - (ACN Newswire) - ACLEDA Bank Plc. 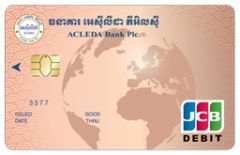 (ACLEDA Bank) and JCB International Co., Ltd. (JCBI), the international operations subsidiary of JCB Co., Ltd., announced the launch of the ACLEDA JCB Debit Card in Cambodia. The launching ceremony was carried out by Dr. In Channy, President & Group Managing Director of ACLEDA Bank, and Mr. Kimihisa Imada, President & COO of JCB International Co., Ltd. in Phnom Penh. 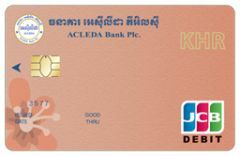 ACLEDA JCB Debit Card gives the customer the delightful choice of making payment by either US dollar or Khmer riel, depending on the card type, which is the first such product for ACLEDA Bank. The holders of ACLEDA JCB Debit Card can not only access the JCB acceptance network with about 30 million merchants, but also enjoy the services which JCB provides including various privileges and discounts on dining and shops around the world. Dr. In Channy said that "ACLEDA Bank Plc. is delighted to be a strategic partner with JCB, the international payment brand based in Japan, which is one of the world leaders in payment services. This agreement will enable ACLEDA JCB Debit Card holders to broadly expand their payment coverage via cash advance locations and over 30 million JCB merchants around the world. The most important point is that ACLEDA ATM card holders can upgrade their status with this ACLEDA Bank and JCB co-branding card. It facilitates not only domestic payment on the ACLEDA Bank network but also global payment from anywhere and anytime." Meanwhile, President & COO of JCB International, Kimihisa Imada said, "We are pleased that ACLEDA Bank, one of the largest banks in Cambodia, has become our issuing partner. I am sure that ACLEDA Bank and JCB will have many opportunities to expand business in Cambodia, which has high potential for the future as the national economy continues to grow."